So should I go for a RTX laptop for my next or is it not worth it and got with a GTX 1080 instead? 3. 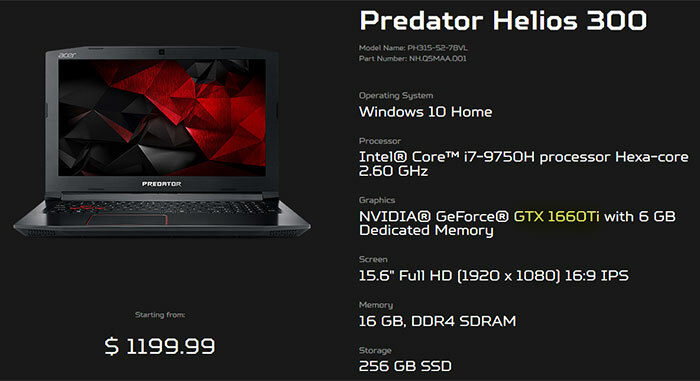 At what price can you acquire a GTX 1080 laptop? I have a 970m right now and I've just been casually browsing Amazon. My budget would prob be $2000 at most. GTX 970M.... hmmm. This is a tough spot. The thing is that you've been sitting on that for a long time as this console generation hasn't really forced you to upgrade, but with the PS5 officially looming you don't want to be dead on day one when it becomes the new baseline and the system requirements PC skyrocket. The new target being a new gen 8 core Ryzen and a 7nm Navi is going to violently wake up all of our GPUs which have been sleepwalking through the last few years of PC ports. My laptop's GTX 1070 is a little shook, my quad core CPU is DOA. As far as buying now, should you? The incoming 9th Gen Intel mobile CPUs are introducing 8-core CPUs from the i7s and up, so you may want to hold out with a budget like yours. GPU wise, with a $2k budget we are looking at a full power RTX 2070, no Max-Q shenanigans. Huge upgrade over the 970M. How are you holding up, gaming wise? Part of me wants to know if you can and are willing to hold out for Nvidia's 7nm 3000 series that's coming next year. That will be the only guaranteed future proof move on the chess board. If you had a 1000 series GPU waiting would be a no brainer, though the 970M still equates itself pretty well at 1080p, especially if you have the 6GB VRAM version. Just bought the 15” 2070 max q....for $1508 after taxes. I recently sold my old Asus UX501 and I'm in the market for something fresh, preferably with an RTX 2060. Thinking about making the jump to 17", for visual comfort mostly. Are there any really compact machines in that size now ? Something that would fit in a 15" case from like 5-6 years ago. Because space is a bit of an issue. Either you get small, or you get power. 17" in a 15.6" frame? No. There are 17" "slim" laptops, but if you want compact, you'll have to bite on a 15.6". Dimension wise, the MSI GS75 is about as "compact" as a 17" laptop can get, yet I doubt it will fit in a case truly designed for 15.6" laptops. 17.3" machines are always about 1.4-1.5" longer than their smaller counterparts. If your case is at least 15.6"x10.3"x.75" you have a shot at the slimmer 17" machines. Yeah I figured this was going to be complicated. Checked out the GS75 and it looks like a great product and good enough size, but woof, 2300 euros for the 2060 configuration is huh... pretty steep. Looks like it's lower than $2000 in the US so I really feel like I'm getting fucked there. Since I haven't had a proper gaming laptop in ages (the 960m in the UX501 wasn't exactly top tier), maybe I'll just start with a 1070 or something because it's probably going to take long before the RTX are affordable, at least in Europe. American prices tend to not include the added cost of taxes until you actually buy it, so maybe not that fucked. Emulation is almost always CPU limited, you can probably max it out on a 1050 Ti on the GPU side for the most part. A 2070 mq is the epitome of overkill for emulation as would a 2060. These new 1660 Ti machines look like they are going to be great values.